Sound and Vision Show Bristol, 24thFebruary 2012. Naim today demonstrated its new high-end NDS network player for the first time publically and confirmed an estimated delivery date of May 2012. The brief to Naim’s R&D was simple: design a network player that is demonstrably superior to the award-winning NDX. As a result, the NDS is a network player capable of the finest musical performance yet. A player that delivers more music with CD rips that most players do with hi-res sources. The NDS adds far more to a system than just streaming. It includes internet radio – the radio of the future. It includes three S/PDIF digital inputs to support connection from computers to set top boxes to CD players. Connect an iPhone or iPod digitally to allow the NDS to control and play all the stored music, podcasts or audiobooks. Play music on a USB stick, even hi-resolution WAV or FLAC files, with full onscreen control. Control the NDS with the front-panel buttons, the supplied remote control or an iPhone or iPod Touch running the optional n-Stream app. The app also allows control of a Naim system’s inputs and volume. The NDS is extremely upgrade friendly: owners can start using it with one relatively inexpensive XP5 XS power supply and as their desires and or bank balance takes them, can move up the ladder to the NDS being powered by two 555 PS supplies. 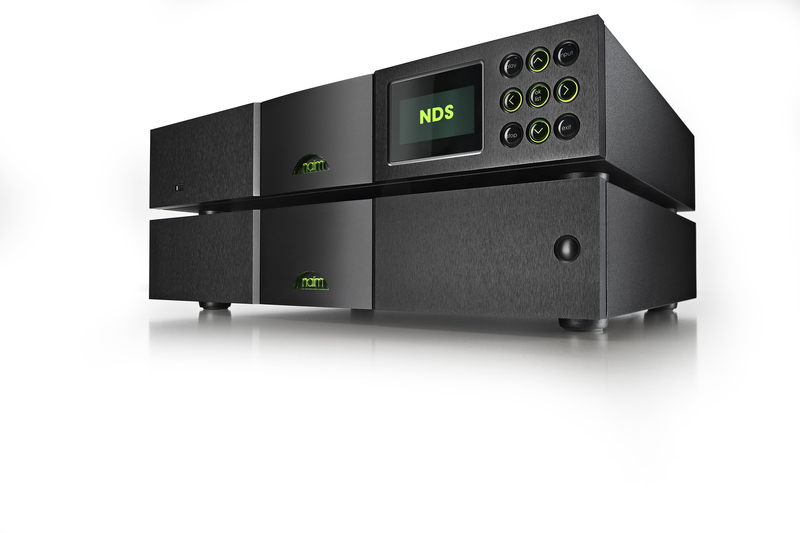 To achieve the significant step forward in performance of the NDS, Naim’s R&D borrowed heavily from the design of the Naim CD555 CD player and Naim DAC. The two main PCBs are each rigidly mounted on a suspended heavy brass sub-chassis that is supported on springs which provide a mechanical resonance below the audible range at 4Hz. Keeping the boards separate for each other also avoids interaction as does the separate grounded brass plates. Data buffering is now exclusively within the DSP chip rather than in external RAM which has brought the benefits of far less high speed traces on the PCB reducing RF interference. Both I2V (current to voltage) and analogue boards now benefit from discrete through-hole circuitry allowing the maximum analogue performance. Shielding cans cover control and streaming module boards as well as the DACs and the DSP power supply. These significantly reduce radiated and received RF noise. The NDS uses the same 16 times oversampling filter as the Naim DAC, implemented in the 40-Bit SHARC processor. The chosen filter is a modified Butterworth filter to which additional poles are added to prevent too much phase shift occurring within the audio band. The filter runs as efficiently as possible, using only five lines of assembly code. This ensures both low arithmetic noise (fewer additions and multiplications that cause rounding) and low power supply noise (since the DSP draws less current when it is not calculating). Reducing power supply (PSU) noise has long been part of Naim’s design philosophy. To increase perceived and measured dynamic range, PSU noise in the NDS is reduced to an extremely low level.